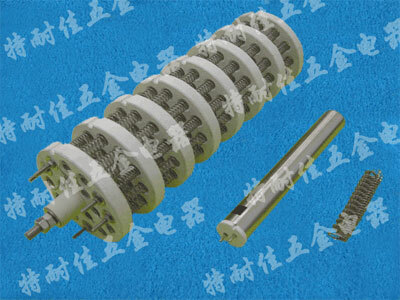 Steatite heater can be used for heating of air and liquids. The heater is often installed in tubes/pipes, which means that the ceramic heating element can be replaced without the container needing to be emptied or the dismantling of ovens, machinery, etc. is required. Steatite heater can be supplied complete with a protective tube and threaded flange. The pipe material is typical made of stainless steel, or acid-resistant material. The complete heater may be supplied with a housing that have different classes and in some cases with thermostat and overheating protection. The housing and the type of connection is determined by the application.